"Death is abstract. It can't be understood." Tom has a mix of emotions as his partner Karin is rushed to the hospital. He's excited meet the child that they are about to be parents of, but he's not so certain he's ready. A struggling writer, Tom fears that his meager income won't be able to support a family. Still, he knows his love for Karin is unwavering, and Tom can't wait to meet their child. What is supposed to be a joyous occasion soon takes a cruel turn. A healthy baby girl is born, but Karin is not so lucky. The discovery of acute Leukemia causes complications during the birth, and the doctors are unable to save Karin. In one instant, Tom gains one love while losing another. He is instantly faced with the challenges of being a single parent while grieving for the love of his life. The novel follows the next year of Tom's life. He grapples with the complexities of grief and love while doing everything he can to give a proper upbringing to his baby girl. he has the support of both his and Karin's parents, but the challenges he faces are uniquely his own. As if the pure emotional obstacles of the situation weren't enough, he also confronts the legal ramifications of not being married to the mother of his daughter and the slow-growing illness that threatens to take the life of his father. 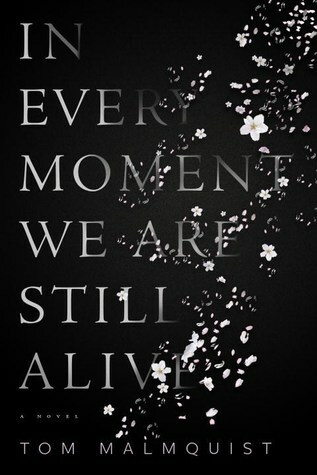 In Every Moment We Are Still Alive is an autobiographical novel by Swedish author Tom Malmquist. The book attempts to tackle the tough subjects of death, grief, and love. While the situation that Tom finds himself in is heartbreaking, I couldn't help but feel a bit removed from the entire story. If felt more as if I were watching everything unfold from above rather than experiencing it with the characters. Whether this is a repercussion of the novel being translated from Malmquist's native language or simply how he chose to present his story, it caused me to have a difficult time connecting on an emotional level with the characters. Still, Malmquist's quiet contemplations about the true meaning of bereavement and family make the novel one worthy of reading. I didn't have the emotional experience that I though the novel would bring, but I definitely found myself reflecting upon the illness and death that has passed through my own life in the last year. This entry was posted on Wednesday, March 14, 2018 and is filed under Book Review,Death,Grief,In Every Moment We Are Still Alive,Love,Sweden,Tom Malmquist. You can follow any responses to this entry through the RSS 2.0. You can leave a response. I've read other translations with no issues, but I think you may be right about this one. Oh too bad you couldn’t connect with this one! Yup I think translations can be wicked sometimes! They are definitely hit or miss it seems. I am sorry it didn't quite give you all the emotions you were hoping to experience from this read... but wow, what a subject matter for an autobiography. It was all pretty dark, but I can imagine how freeing it must have been to the author to write about it.